With growing numbers of retiring baby boomers reaching record highs, their dreams of moving to warmer climes dance like sugar plumbs in their heads. Imagine retiring to Mexico…the vision of swimming in the blue green waters; relaxing in a hammock while reading your favourite crime writer; or sipping a piña colada from a freshly cut coconut. Yes, the visions are endless, but before you sell everything in a mad scramble to claim your stake in paradise there are a few things you need to know. We’re not in Kansas anymore Dorothy! Yes, you are in a foreign country, which, depending on where you were originally from, can create quite a severe culture shock. Basically nothing is as it was back home. The smells and sounds (some good, some not so good) are plentiful in an environment that values the family above all else. While the minuses might be a cacophony of music blaring from your neighbours stereo at 5am, the plus is that elders (“tercer edad” – the third age) are highly respected and you’ll be pleasantly surprised to find the curtesy with which you are treated by the youth. And surprisingly, that includes teenagers! Since the Spanish conquistadors introduced it (yes, ok, they forced it on everyone), Catholicism is the religion that has become culturally engrained in every day things. It’s quite common to find shrines for Mexico’s national saint, The Virgin of Guadalupe, in the most unusual places…restaurants, on city buses or a random street corner. It’s primarily for these religious reasons that Sunday is considered “family day”. You will find large groups of relatives spending time together at the beach, sharing meals or just hanging out at home. It’s the day of rest and they take it to heart. “Fiestas” (parties) can take place any day of the week, celebrating a birthday or baptism. And unlike our culture, Mexican parties are inclusive of all ages. So it’s not unusual to see small children running around knocking down a piñata & enjoying the festivities along with their grandparents and teen cousins. Respect is the most highly regarded value and come down equipped with plenty of it, because if you respect others, they will respect you…yes, your mother was right! Respecting that you are essentially a guest in the country and acting likewise goes a long way in becoming part of your new environment. There is one thing I did learn though, and that is that no matter how many years I’ll spend in my new country, I will always be viewed as an “extranjero” (foreigner). Heck, I have a Spanish first and last name and can speak the language fairly fluently, but as soon as I open my mouth, they can tell I’m not “from around here” because the one thing I will never lose at my age is the accent! Se Habla Español. OK, no one expects us over 50’s to just jump in and become fluent in a new language overnight but being able to at least communicate a little with the citizens of your newly adopted country is invaluable. You’ll find that they are often very amused by our “accents” and will help you out as best they can. Granted, there are some communities where English is widely spoken due to the large number of ex-pats and tourists in that area. However, I really encourage you to get to know your Mexican neighbour or your housemaid a little better with your broken Spanish or “Spanglish”. With a little effort, you’ll reap the many rewards of friendship and develop a sense of real community. There are some great FREE resources that can get you going in the right direction. Duo Lingo and now Rosetta Stone offer some awesome apps that can be downloaded to your newly acquired iPad / Android. They are very user friendly and easy to follow. Or even before you head down, check out your local community. One suggestion is MeetUp.Com which often have groups that meet in your area to practice speaking another language. 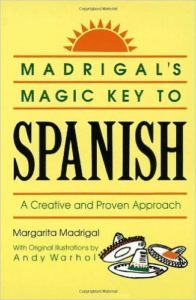 But if you’re more of a hands on book learner, I highly recommend [easyazon_link identifier=”0385410956″ locale=”US” tag=”thesolosnowbi-20″]”Madrigal’s Magic Key to Spanish”[/easyazon_link]. I have used this book often over the years to improve my language skills and teach others. They provide fantastic tricks to help you convert English words over to Spanish as well as easy ways to remember verb tenses. Mañana doesn’t mean tomorrow, it just means not today. If you’re expecting things to run at warp speed as they do back home, think again. Mexico, and for that matter, most latin American countries have the reputation that things run at a snail’s pace. While that may be true when lining up for you paperwork to get processed by what seems like an endless line of government officials, it’s not always the case. For example, within a matter of hours, Mexicans can arrange and execute a fiesta & parade along with the fireworks that follow with amazing results! And hours later you’d never know that thousands of people had participated, because all the debris has been collected and everything is back to normal in record time. They certainly bring new meaning to the term “party planner”. On the flip side, if you’ve arranged for a repairman to come to your house “mañana”, well that may mean tomorrow to us but really it means, just not today. So patience is a blessing and something you need to come supplied with plenty of. And besides…didn’t you come here to get away from the rat race and relax anyway? Security / Safety. OK, we’ve all heard the horror stories about what seemingly goes on in Mexico. The major news sources love to dwell on it. While there’s no denying that crime happens, Mexico as a whole ranks well below the worst for crime rates per capita compared to other U.S. cities (see http://howsafeismexico.com/compare_mexico_us_cities.html). Mass shootings and “going postal” incidents are, unfortunately, a common occurrence in the U.S. but a rare event south of the border (excluding the goings on amongst the cartels, of course). The majority of problems occur at the border regions and don’t normally involve tourists. However, to be diligent and for your own personal safety, the key is to use the same common sense you use back home. Yes, just like in Canada and the U.S., there are “good” and “bad” neighbourhoods, no different. And there are good and bad people. But I wouldn’t expect to find you wandering around alone in downtown New York or Toronto at 2 or 3 in the morning, so why would you do that anywhere else? Remember the adage…if you look for trouble, you’ll find it. So keep your nose clean and don’t mess with the criminal element and you’ll be fine. Listen to your gut feeling. It’s always been my saving grace. And as a woman on my own in Mazatlan, I make sure I am aware of what is going on around me, but not in a paranoid way. One trick I use is, if possible, to walk on the street (not the sidewalk) in the evening if I am on my way home after sunset (watching out for traffic, of course). Doing this will allow you a wide berth to walk, avoiding darkened doorways. In some areas of Mazatlan, the streets are actually less “trip” prone and in better repair than the sidewalks so this could be a sensible practice anyway. In the 5 years I’ve been in Mexico, I’ve never once felt unsafe or nervous about my security. And I definitely can’t say that about my home country. How much does it cost to live in Mexico? If I was ever asked what was the top question I get about retiring to Mexico, this has to be up there…next to the “safety” one, of course. And my standard answer is usually, “whatever the cost is for your current lifestyle up North, you can estimate spending about 1/3 of that”. Mexico is certainly a budget wise retirement option. It normally ranks as one of the top 3 countries that is the least expensive to retire to (Panama and Ecuador have been their main competitor over the past several years, although I see that Nicaragua is now making an appearance on some lists). While your biggest expenses back home can be food and accommodation you’ll be pleasantly surprised to find that this is actually the least expensive of all your living costs in Mexico. You’ll find a plethora of fresh fruits and vegetables that would be either not available back home or cost prohibitive if they are. So healthy eating is certainly very easy to do and economical as well. If you are living close to the ocean side, then add to that list the abundance of fresh seafood. My favourite is “espada” (swordfish) because I can grill it or eat it as sashimi. I buy it from my local “fish guy” at about $100 pesos/kilo (about $2.50/lb). Accommodations can range from 5 star luxury condominiums to very rudimentary apartments. But at a fraction of the cost (both to rent or buy) one can afford a much nicer place than in the North. This is particularly valuable to retirees trying to survive on restrictive Social Security or Canada pensions. Along with accommodation and food, the quality of medical care is excellent with many private hospitals equipped with state of the art equipment and top notch U.S trained doctors. Medical care is also not cost prohibitive. If I had to name something that was relatively more costly than up North though, I would have to say, buying anything with a plug is a rule of thumb. So, computers, lighting and small appliances are best brought with you. Overall, retiring to Mexico comfortably and inexpensively is definitely achievable! Come equipped with an open mind, an open heart and a reasonable dose of patience and you too will fall in love with it as I did. I highly recommend it! Next story Madrigal’s Spanish Magic! Previous story Who’s your “guy”? I really think you posted this well, we have been saving and researching and spending a lot of time to move there, 15 years, well we just sold the house, moved into a temp 700 square foot apt and in 9 months will be moving, have a couple trips already planned in next couple of months just to scope out where and try to secure place…I think everything you said hits it on the head. Thanks Connie for your comments. It’s always a work in progress as I spend more and more time in Mexico and I accumulate resources/information. I love sharing what I have discovered with others as well as learning from the incredible people around me!